If you have stories about amazingly speedy recoveries from ankle injuries, post up! Here's mine (it's a WIP): I rolled my right ankle bouldering yesterday, a week before heading to Spain. Amazingly, I was able to crush despite what the X-ray photos below might suggest. The red in the photos points out where the doc told me my ligament pulled off a small chip of bone. I'm currently RICEing, taking Naproxen, and staying off of it. 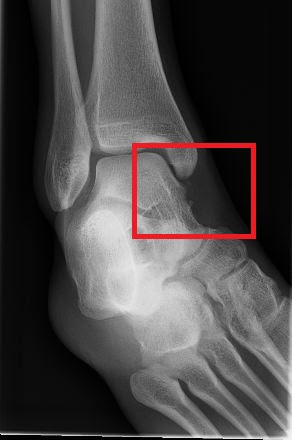 If I rolled onto the outside of my ankle, why did the ligament on the inside of my ankle pull off the chip of bone? Wouldn't it seem like the outside sustained more trauma? I shattered my ankle last year fighting off Iranian terrorists. It healed in three hours. You should be fine. Exactly what I was looking for! Thanks, cous! Here's my WAG: When you hit the ground, muscles on both sides engaged. As the ankle rolled to the outside, the outside tendon was pulling tangent to the bone. 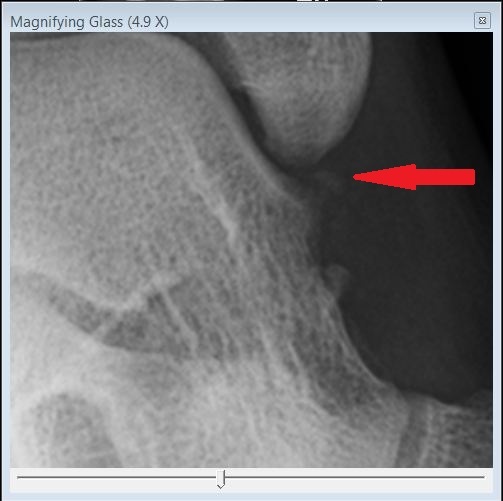 But since your foot was collapsed to the inside, the inside tendon was pulling away from the bone and pulled a chip off. I don't see how an inversion ankle sprain can create tensile forces in the medial (inside) of the ankle. I could see a bony contusion an possibly the compressive forces of bone on bone causing a medial bone chip, but not because the ligament pulled it off. The deltoid ligament on the inside of the ankle is a broad fan shaped ligament and would be unlikely to pull off a bony fragment in one spot. But, there is lots I don't know... so who knows. I am curious and will do some reading to see if I can find a source that says otherwise. Do you know how to tape an ankle? Thanks, guys. The ortho actually suggested both of those scenarios as having been possible. C2C, if you've got some beta, I'll take it! Beta for taping? Pretty easy. Just google it. If you need more specifics, let me know I and I would be happy to help. Hell, I thought you had some super secret refined and perfected over the years ankle taping beta that you were hiding from Google's crawlers. But seriously, thanks for filtering out the bad advice for me - I have very minimal medical knowledge. I wonder if that girl would just come to Spain with me. All that in < 3 minutes... I'm pretty sure it still takes me > 10 minutes to make tape gloves. Maybe one day you can return the favor and teach me how to climb hard! I rolled my ankle outward to the ground 3 years ago. I now have a nice cyst on top of my ankle and it still hurts today. I hope this inspires you. Sorry to hear it Yasmeen. My brother told me about it cuz he was at the gym and thought it was gonna be a bad one. Hope you can get through it OK in time for your trip to Spain!